I'm ...uh... Mimic, which you probably know at this point. This account was previously known as Hobomom and Mimic. My mom and I joined the TP in 2007 (she was Hobomom, I was Mimic). Mom wasn't particularly interested in ponies, but nonetheless encouraged my hobby, and joined for the purpose of parental guidance. (I was eleven ten, I can't count..) She no longer uses this forum. Come this December, I'll have been a member for ten years. These days, I mostly lurk within the community. My life is different. I don't actively collect anymore, as there's no longer space or finances to support it. But I still find myself adding here and there, even if only twice a year. The few remaining collections are a motley crew of G1s, G2s, G3s, Fairy Tail birds, G2 LPS, various dolls, a handful of Pokemon cards and a couple Breyers. Outsides of ponies, interests include knitting, crocheting, reading, gaming, cooking, horseback riding and traditional / digital art. I raise poultry, and have an old horse that likes to chase cows. Beyond that, I'm a pretty boring kid. I'd like to eventually become a vet technician, but due to a host of various reasons the chances of me attending college are pretty low. 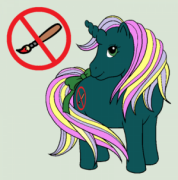 I'd like to become involved in the arts and crafts aspect of ponies again - I deeply miss it. Heya Mimic! Glad to see ya back! You obnoxious? Nah! Hello from a brand new baby pony! Hi Mimic! So good to have you back! Hey if you need help applying for Financial Aid for school, I also was in your situation of not having finances to go to college but I learned how to navigate the Financial Aid Grant programs and it paid for my first two years of school. I can help you with that if you want some advice just PM me! Welcome back to the TP!